View your Dolphin Quest program photos on our online photo store! Videos are also available for purchase at our Hawaii location. Learn more about photo and video availability, specifications, pricing, and more below. Dolphin Quest’s photographers will be taking posed and candid photos throughout your program. Your program photos are available for pre-order or as a post-program purchase. You can view and order your encounter photos on-site immediately following your program using one of our Dolphin Quest photo ordering stations. Someone with you who is not doing the program may take pictures or video your interaction from the spectator side of the ropes and railings. Photos will be available in print and/or digital format which you can download to your smartphone or computer once purchased. You then can immediately post your photos onto social media and/or e-mail them to friends and family. Pre-order pick up, viewing, and post-program photo orders is available onsite at Dolphin Quest. Your program photos are available for purchase onsite at Dolphin Quest up to 5 days after your program during operating hours daily. 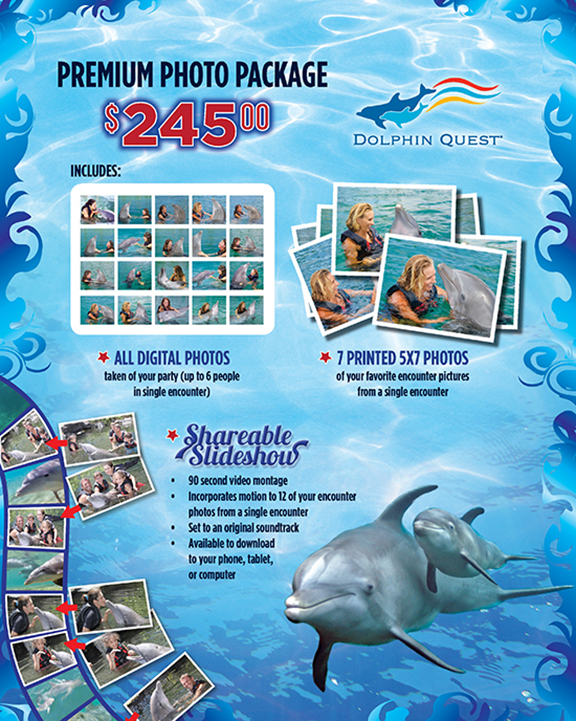 If you are unable to purchase your photos directly from Dolphin Quest while onsite, on-line photo ordering will be available for 14 days from your program date. 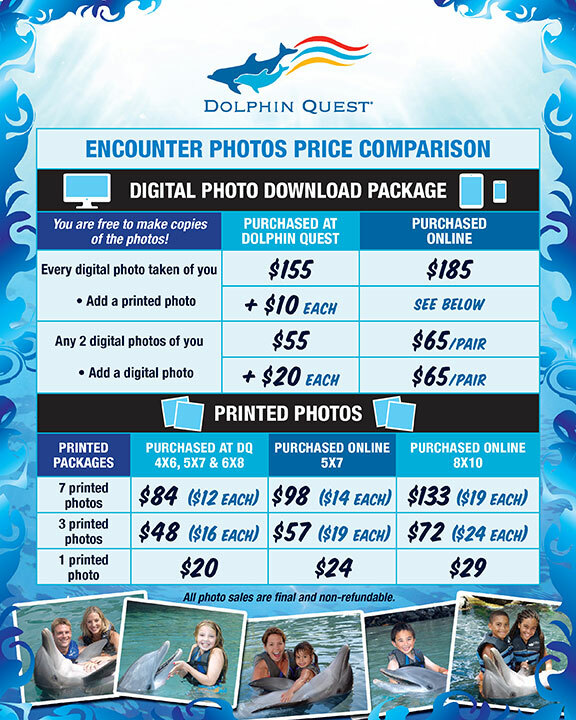 Encounter photo prices are the same at all our Dolphin Quest locations. Encounter photo prices are lower if you purchase them on-site immediately following your encounter as compared to purchasing them later online. Please refer to the video tutorials below to learn how to navigate our online photo store. Dolphin Quest Hawaii on the Big Island of Hawaii is the only Dolphin Quest location that offers video filming of all programs. Dolphin Quest facilities on Oahu and Bermuda do not offer video filming of their programs at this time. Non-participating guests and family members are welcome to film you during your program from the spectator side of the ropes and railings. Videos are only available at the Dolphin Quest facility on the Big Island of Hawaii. 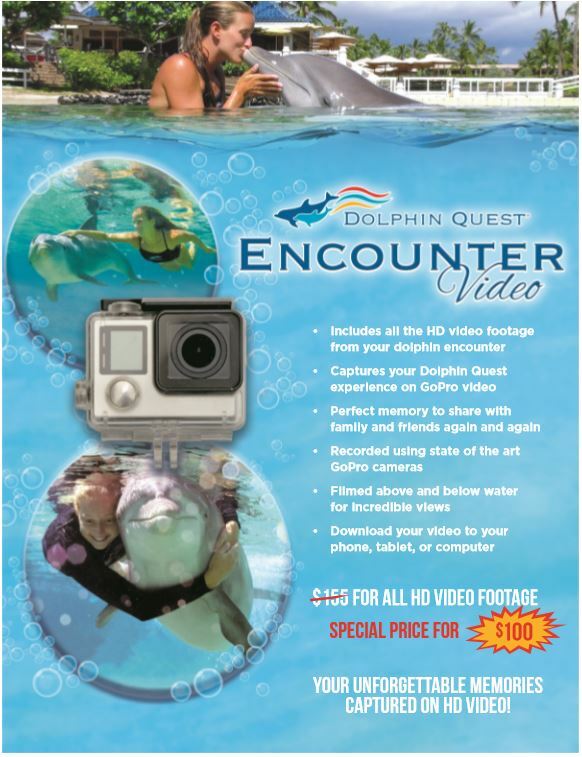 Dolphin Quest videographers can film your encounter using GoPro cameras. Video is taken both above and below water when appropriate. Videos are provided to you via electronic download to your computer, tablet, or phone, within 24 hours of your encounter. Or, you can receive your encounter video on DVD or jump drive for a small additional charge. To secure the video product, you should pre-purchase and reserve your video online during the encounter reservation process. These videos are available on a first-come, first-served basis. Please be advised that other guests in your encounter will also appear in your video. Videos must be reserved and purchased during the encounter reservation process or onsite when checking in for your encounter. To help assist our guests regarding our online photo site, please watch the three tutorials below. For your reference, we have noted what topics are addressed in each video. Sharing photos via e-mail, Facebook, etc.